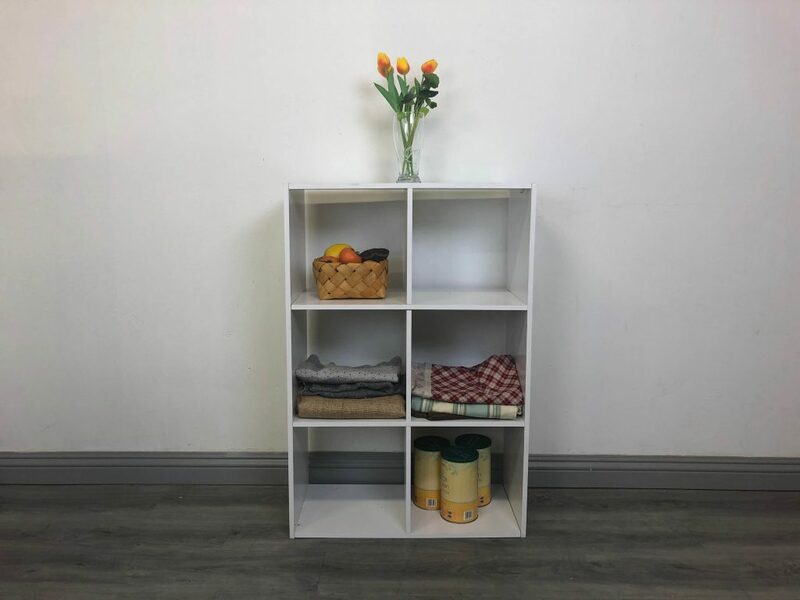 Cube organizers are one of the most versatile pieces of furniture in home décor and most models are RTA (Ready to Assemble) and can be used immediately. Because cube organizers appear uncomplicated, many customers think choosing a cube organizer is a matter of taste and practical need. However, since most of these shelves are usually assembled at home and very few know what to expect in the process, RTA Cabinet Reviews presents a full comparison review on cube organizers currently on the market to see if these simple designs are complex to handle. What materials is this cube organizer made of and what options are available? 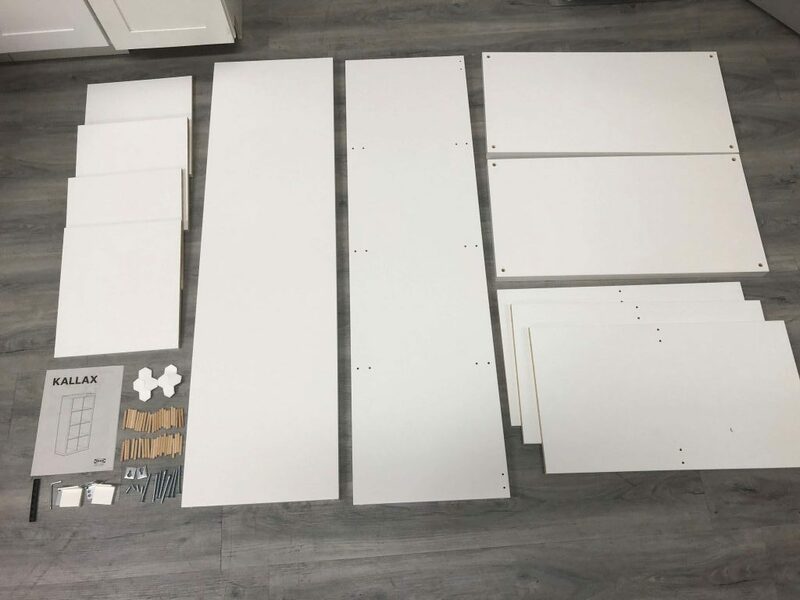 How easy is it to assemble the product? What does the final stage look like and how does it compare with the picture in the advertisement? Who is most likely to use this product? Are you better off buying a stack of crates or cardboard boxes? Contrary to popular belief, this cube organizer is not approved for flight by the Federal Aviation Administration. The main materials in this organizer are fiberboard and particle board so the whole package is relatively light at 35 lbs. The shelves and partition are made from a slightly different material than the outside panels. 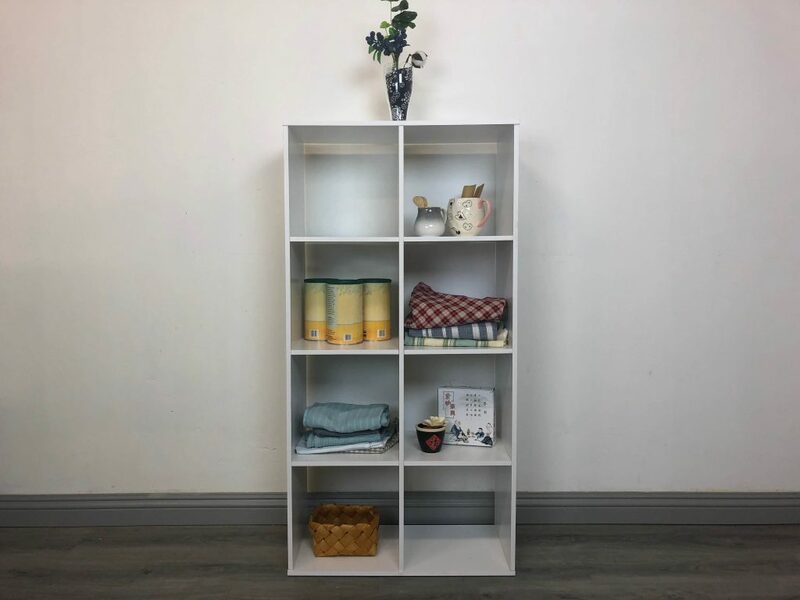 At the time of this review, the Flysta is only available in White and while there’s no other additional options or accessories specifically made for this model from Ikea, Ikea recommended storage boxes and magazine files to go with this product. There are additional wall mounts included and foot pads for the bottom of the organizer, whether upright or horizontal. 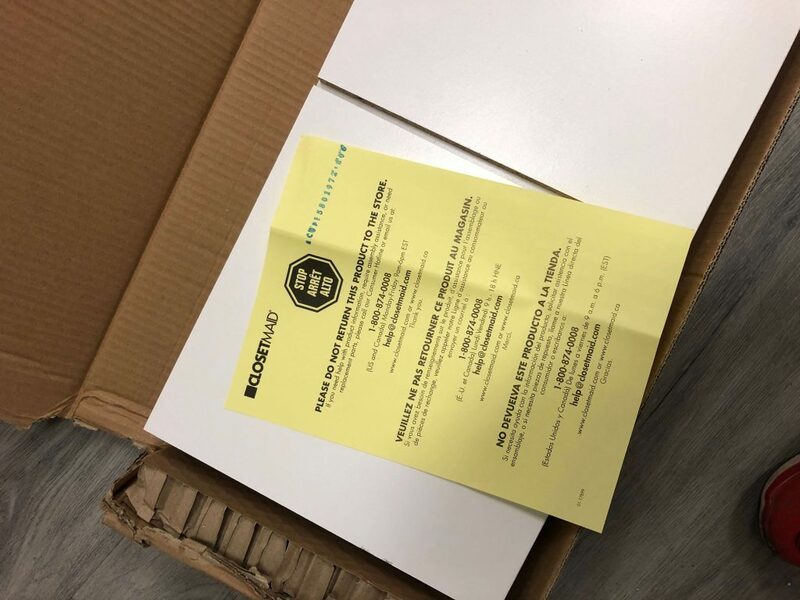 The package arrived with paper sheets separating the boards. There are a couple of light scratches on the paint finish, but otherwise, this arrived in good condition. Ikea instructions are all pictures so I’m treated to a little comic strip on how to prepare my adventure into assembling this cube organizer. While armed with the appropriate warning, the only extra tool I needed was a rubber mallet to make sure the dowels were firmly lodged in their holes. The setup comes with a hex key and a black plastic handle that makes it easier to use. The diagrams make this very easy to set up even without written instructions. After a while, putting the pieces together became intuitive. But as I assembled the piece, I felt it was easier to turn the entire structure around than it was to use the hex key in awkward body positions on the floor. Fortunately, the structure is light enough to do that, but I still had to be careful when putting this together. Metal bolts are screwed on the ends and the product is complete. It was easy to scratch the paint but since this cube organizer is white, it was hard to detect. I finished assembling this product in 40 minutes. The Flysta looks like the picture online from IKEA. I am pleasantly surprised by how sturdy this is, despite its light weight. I have no issues moving this around by myself and if you use the foot pads, it will not scuff your floors. 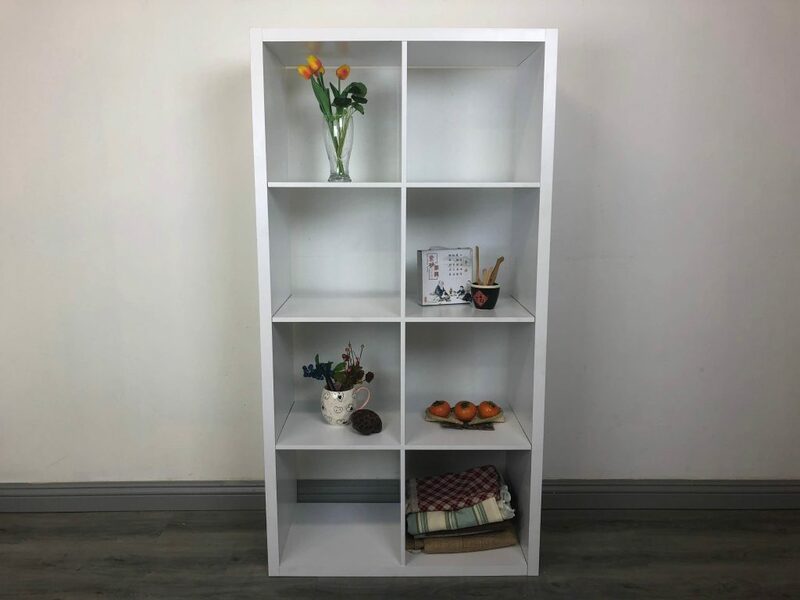 The Flysta would be good for a person who wants a clean looking bookshelf or wants to use this as home design furniture to accent their rooms. 3 out of 5 cubbyholes. 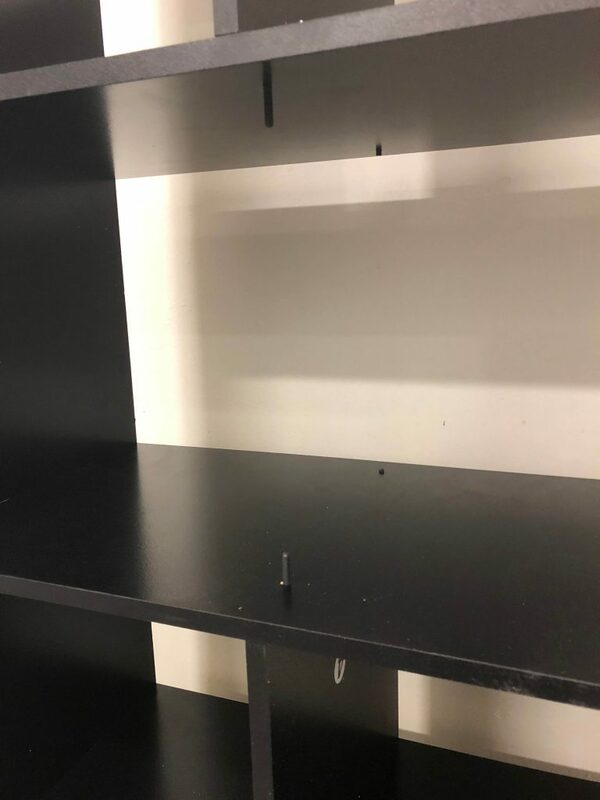 The IKEA Kallax is a popular brand of shelving, popular enough to inspire enough an article that claims it is the best brand to store vinyl records. 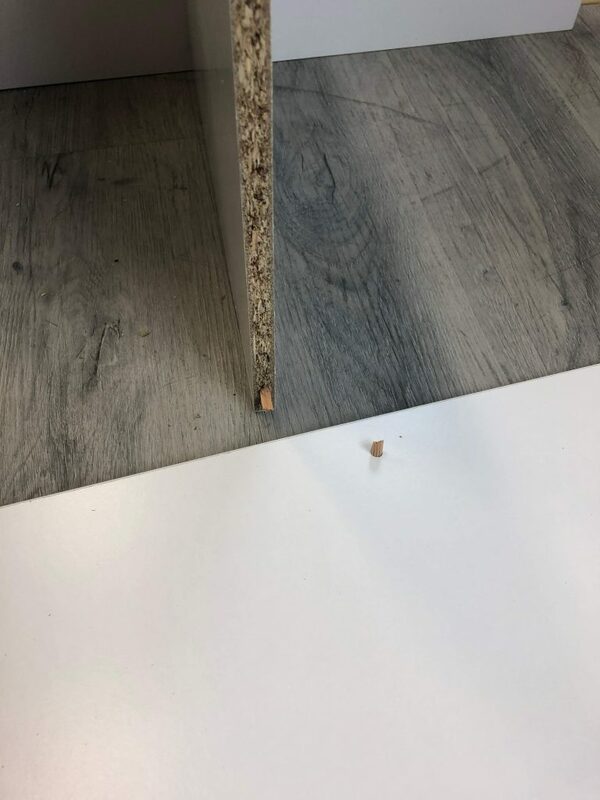 The main materials are particle board and fiberboard, similar to the Flysta. However, the significant differences are that the package is twice the weight at 73 lbs. and the shelves and the partitions are made of the same material as the outside panel, so this product will end up with a more uniform look. The individual pieces feel heavier, so I expect Kallax to be sturdier than the Flysta. 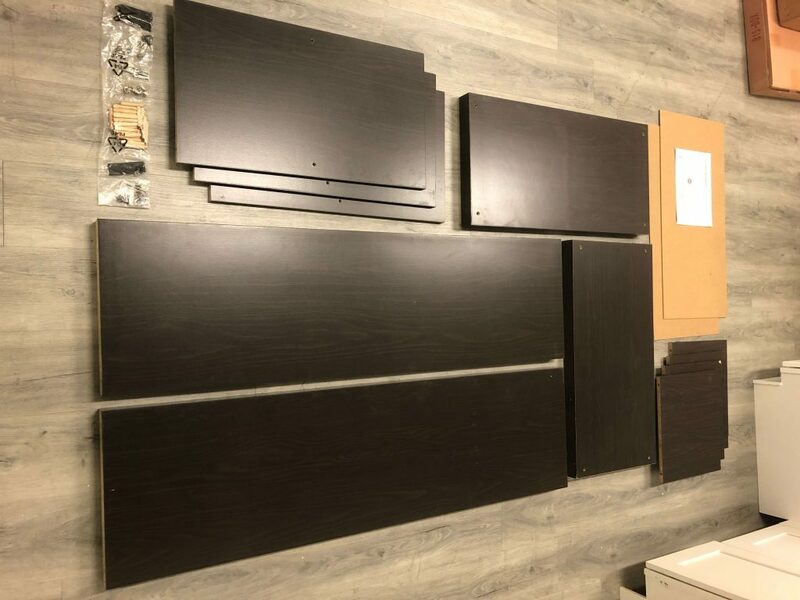 There are seven different colors currently offered at Ikea of the Kallax shelf, including different colors on the outside panels from the partition shelving. 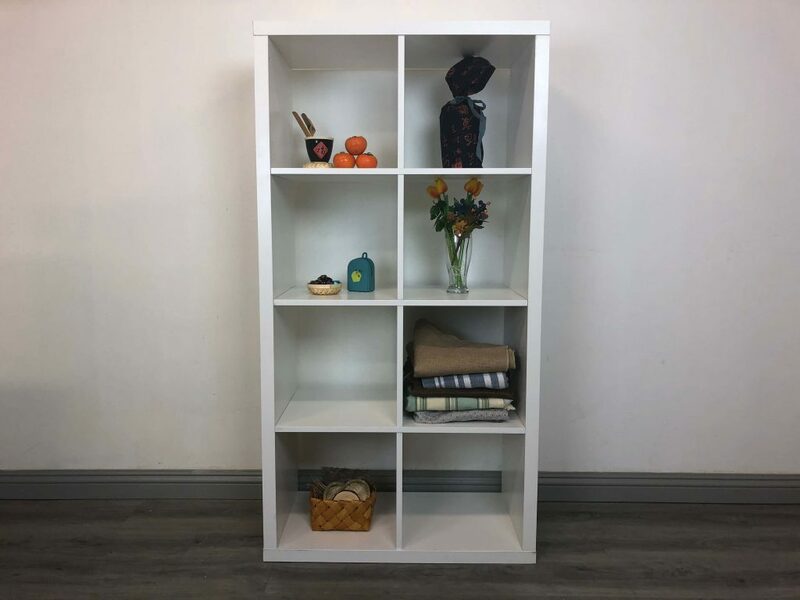 The Kallax brand has additional accessories including doors, drawers, casters and a workstation. 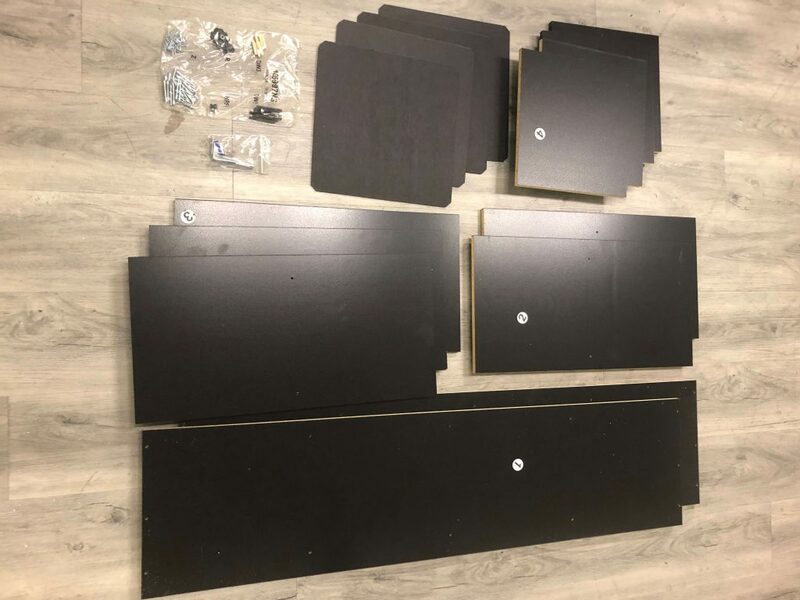 It is important to note that Ikea does not classify the Kallax shelf unit as a cube organizer when searching for the product on the Ikea website. The fixings are slightly different, in fact, they feel more simplified with only one size dowel to worry about. Like the Flysta, this product comes with wall mounts and foot pads. The package arrived in excellent condition with no scratches on the surfaces that I could detect. 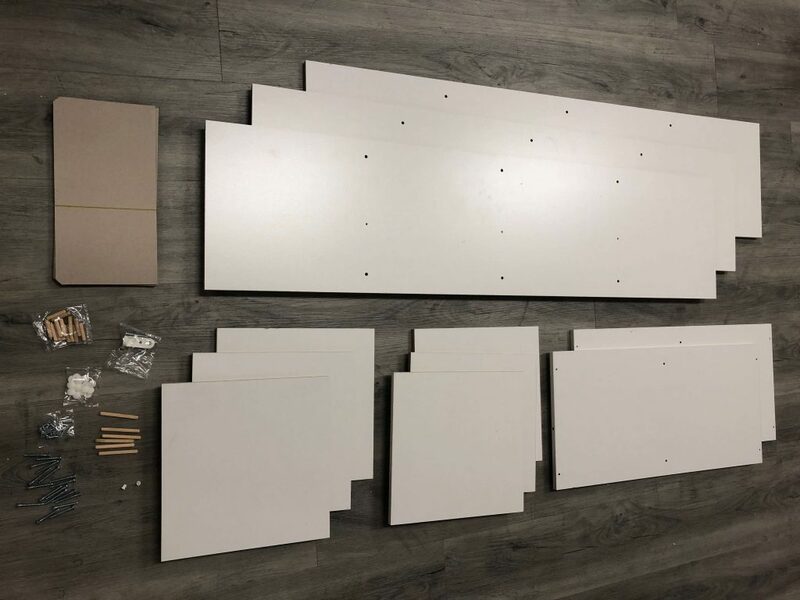 Ikea instructions for the Kallax are much simpler than that of the Flysta; each shelf connects to the other shelf using four dowels. It feels intuitive to put together and the diagrams are very clear. The challenge is to get all four dowels to line up with the openings and even then, that was not difficult to do. The metal bolts securing the ends go in very smoothly with almost no resistance because of the predrilled holes. The surface of the product did not end up with scratches when fully assembled. Assembly was completed in 40 minutes. 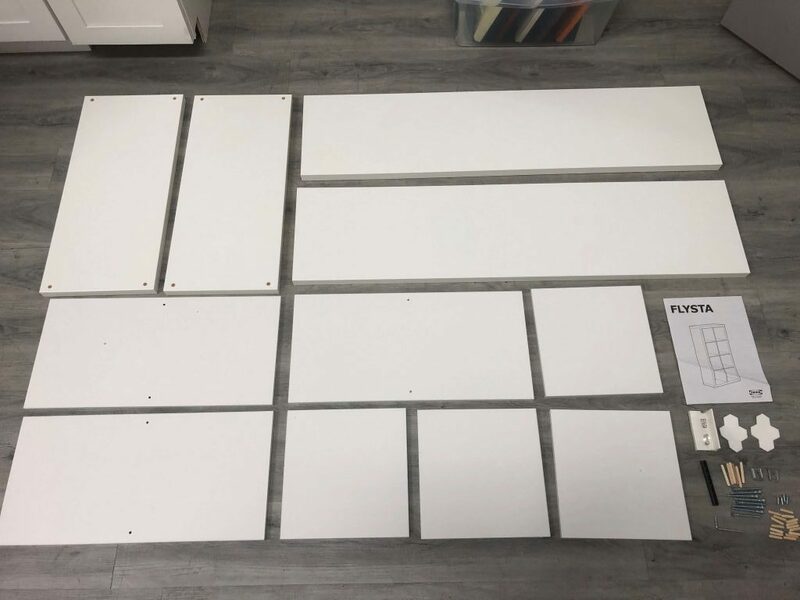 The Kallax looks like the picture of the product in Ikea. In person, this feels like a substantial piece of furniture despite the simple assembly. The 13″ x 13″ openings, the thickness of the panels and uniform look of the shelving make this cube organizer look very attractive. 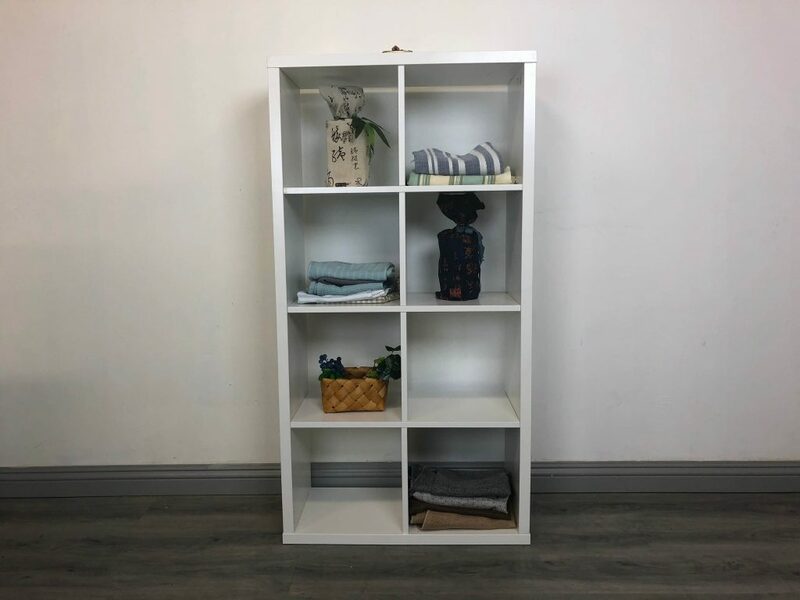 The Kallax shelf is a versatile piece that can be used in home décor and storage of many things like books, vinyl records, and files with the addition of the door or drawer accessories. 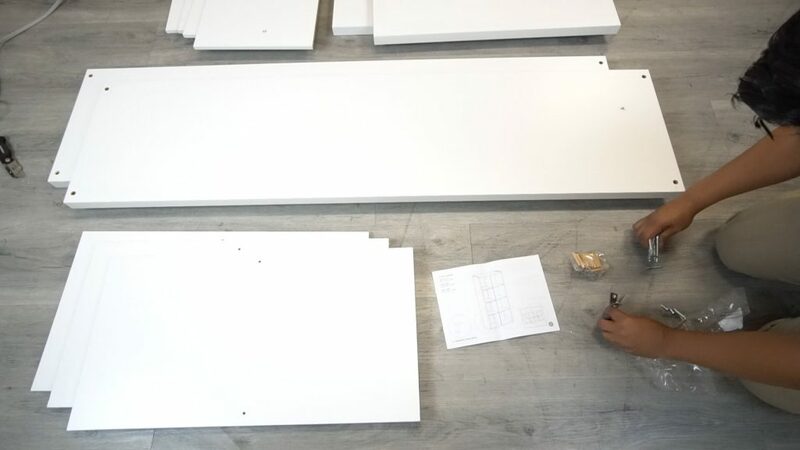 It can work in both home and office, but it is a more substantial piece of furniture with large dimensions; this needs to be kept in mind wherever you assemble this. No. This is a good, solid cube organizer that is easy to assemble. 4 out of 5 cubbyholes. Better Homes and Gardens are more than just a magazine showing off the latest in home décor. They have a line of furniture available in several places from Walmart to Wayfair. 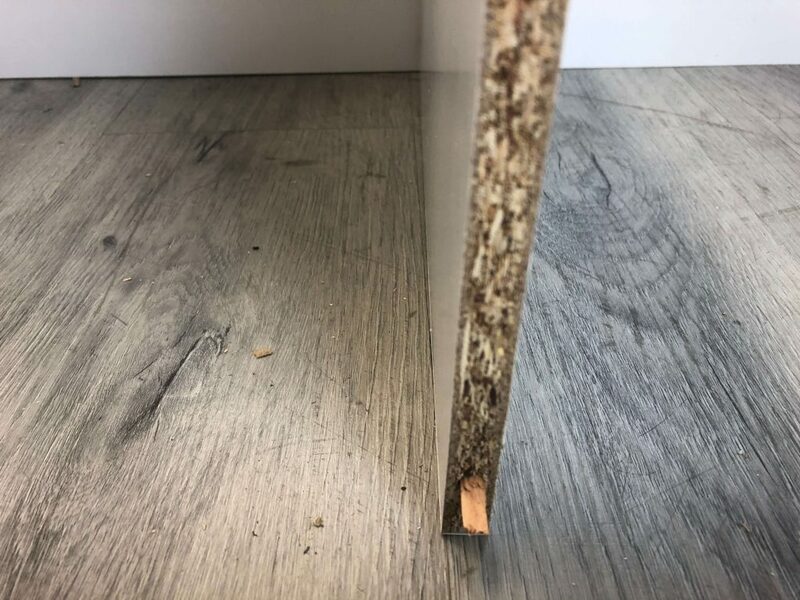 The main materials are MDF (Medium Density Fiberboard) and particle board which contribute to its heavy package weight of 80 lbs. The sticker in front of the package stated this should be lifted with two people. Although this was well packaged with styrofoam and heavy cardboard, when it arrived, a couple of the shelves had dents in them. There is a safety strap with screws that come along with the product rather than brackets. Right away I noticed the finish is very easy to scratch, although keep in mind, this was the only cube organizer that arrived in Espresso and scruffs tend to appear more easily on darker surfaces. The BHG Cube Organizer comes in eight different finishes from High Gloss Black Lacquer to Pink, although most selections tend to be natural wood finishes. This is a standalone product with no other accessories. This package requires both a Phillips and a flathead screwdriver for assembly. The instructions are a combination of short written words to go along with diagrams, and while each panel may look crowded with information, it displays everything you need to know about each step. Each board is labeled with a small, round circular sticker that corresponds to the diagram, so there is no mistake which piece connects to others. 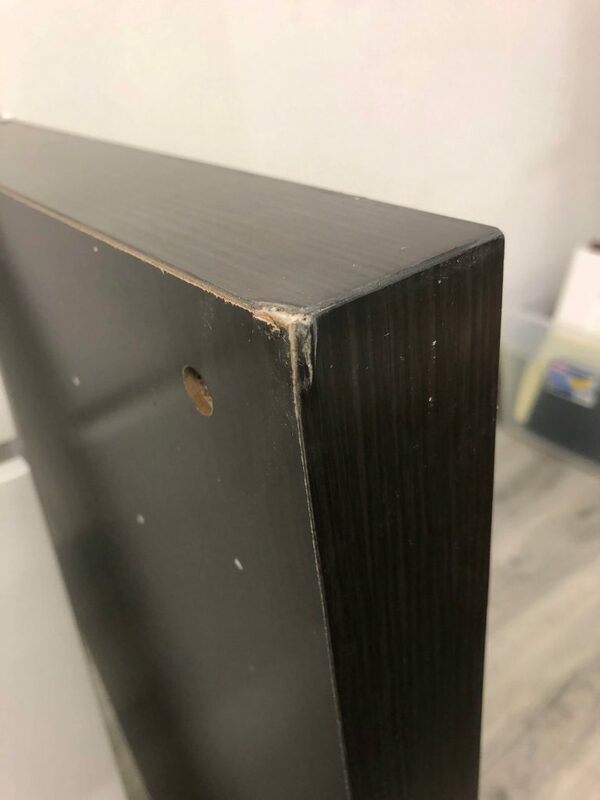 The dowels slip right into the openings without feeling loose, and when the partition matrix stands on its own, it does not feel like it will fall apart. As far as the fixings go, this is the only package that includes washers in the assembly and a cam lock and cam bolt system to secure the structure. The most challenging part is getting all of the dowels from three separate shelves to fit into all of the openings on the long panel because this has to be done on both sides. There is a bit of going back and forth on both long boards to make sure all the dowels line up, but once all these dowels line up, it feels pretty secure. When the cam lock system is tightened on both sides, then it is fastened for sure. Assembly took about 50 minutes. Extra time went into making sure the panels lined up with the dowels. Aside from the product lighting that gives the cube organizer depth, the Better Homes and Garden cube organizer is a solid piece. It is a shame that the piece scruffs so quickly and as mentioned before, there is a certain amount of leeway when dealing with a dark color, this is a sturdy product, so I don’t want to think of treating the finish delicately. Maybe because the brand is Better Homes and Gardens, the accompanying description (from Walmart) is that this cube storage organizer is meant to store curios, photos, and knick-knacks, suggesting that this was intended to be more of a display piece. The BHG is an attractive cube organizer, and I can see that a real estate agent would use this piece to stage a house they want to sell. 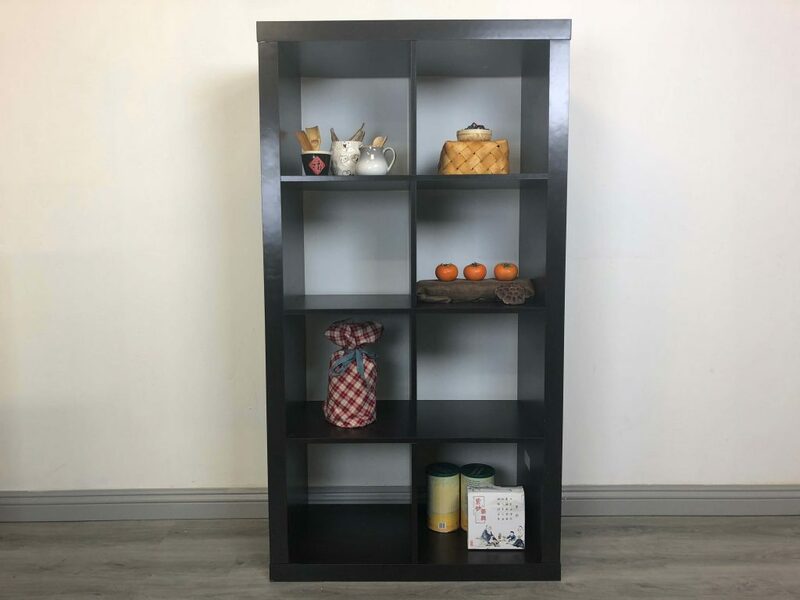 A larger version of this can be used as a room divider in a college dorm with a place to store books; maybe not much for privacy with a dormmate, but still a useful piece. 4 out of 5 cubbyholes. The natural scratching and chipping are the reasons why this isn’t a 5 cubbyhole rating. 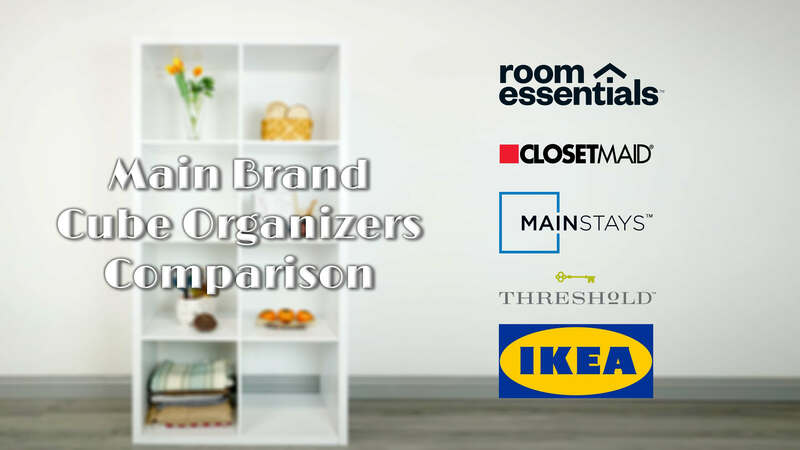 Room Essentials is an exclusive Target brand whose affordable furniture is meant to um… target teens, college students, and first home buyers. The main component of this cube organizer is wood laminate (a resin fiberboard that has the appearance of wood), and the package weight is on the lighter side of these comparisons at 41 lbs. When unpacking the shipment, the panels felt light. Not in the same way the Flysta boards were light, but I expected I should not be storing heavy items with this. Parts of the panels were chipped upon arrival. There are a couple of L-brackets and wall screws that are included with the package. There are also cardboard back panels and small nails provided as an option. The Room Essentials Cube Organizer comes in Espresso (dark brown) or White. This cube organizer does not come with accessories, but the product listing at Target suggests fabric bins to go with this. A Phillips screwdriver is needed to put together this cube organizer, and a hammer is only required if you want to add the optional cardboard back panels. Just looking at the panels, I could tell there will be a problem with the structure right away. 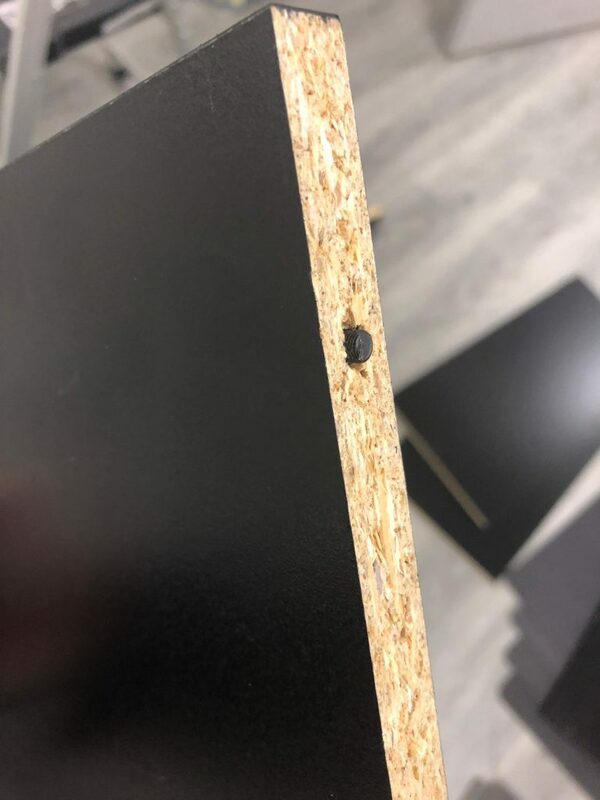 The holes where the screws are going to connect are very close to the edge, so this is not likely to be stable. If this cube organizer collapses, it’s because these corners gave way first. 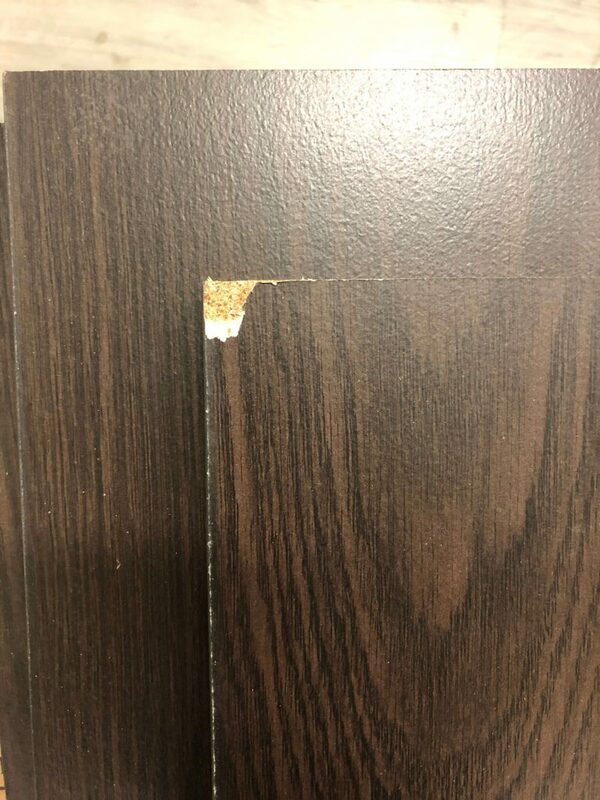 The other thing is that this product as a facing side and a rough side which is just straight particle board. While it will be easy to tell which side is the correct facing side, this means this product is always intended to go against a wall. Also, the rough particle board is dry and dusty, I had to stop in the middle of the assembly to moisturize my hands before continuing. When completed, the corners were not thoroughly flush which hurts the OCD part of my heart. Assembly time was 35 minutes, including washing my hands. When compared to the product picture, yes, it is technically what I assembled. But it’s the equivalent of the “Serving Suggestion” on food boxes; it doesn’t quite match my expectations. 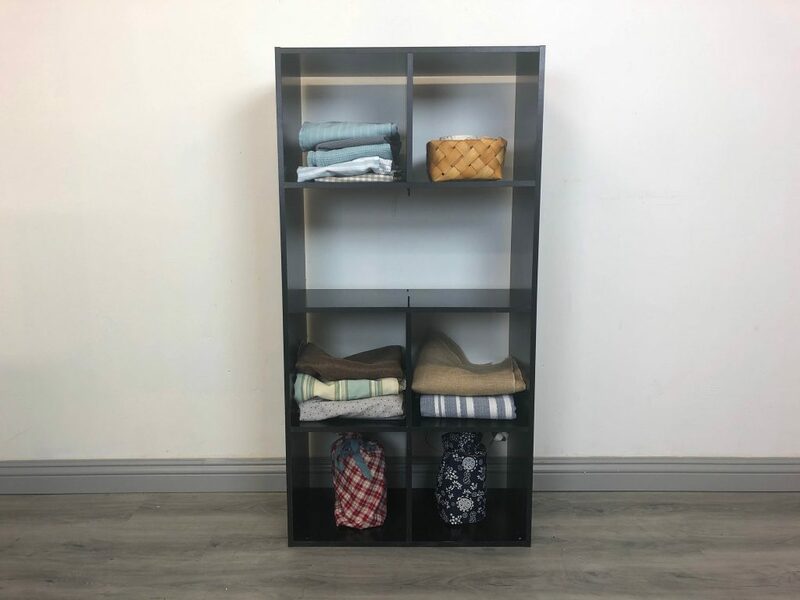 I wouldn’t recommend this product to anyone, but if you had to use it, it would be the type of cube organizer you would use to store clothes as part of a closet organizing solution where you’ll never need to see the back of it. As for books, this would be fine with paperback books, but I wouldn’t trust it to hold the entire hardbound collection of William Shakespeare. As part of the product, they enclose backings made of cardboard. Literally. Part of this cube organizer is a cardboard box. I would instead buy a stack of crates or pay just a little more for a sturdier cube organizer. 1 out of 5 cubbyholes. Room Essentials and Closet Maid are the same product. There is one difference: The instructions. The instructions from ClosetMaid seem to have more clear diagrams. For the sake of this comparison, I assembled the product. It was a 6-cube organizer, so maybe there’s a difference somewhere. But assume that all the notes from Room Essentials are also the same for ClosetMaid. The dowels for this cube organizer were tighter to fit into the holes. I don’t know if that makes this more secure, but it was more annoying to put together. But worse, as I put in the screws to finish, parts of the particle board came off. I was not happy after assembling this. Threshold is a Target Brand that focuses on overall home décor with an emphasis on classic style and is one of their regular brand lines of that store. The main materials for this cube storage are wood laminate which explained why such a massive package only weighed 47 lbs. The boards were thicker than that of ClosetMaid or Room Essentials, so they looked like they would be sturdier. The components did not arrive with any dents or scratches to speak of. The package comes with L-bracket mounts and associated fixtures. According to the instructions, casters and feet for the Threshold cube storage are available but sold separately. The Threshold Cube Storage comes in three finishes: Weathered Gray (which appears brown), Avington (which sounds like a contemporary baby name but is their version of very dark brown) and White. Following the directions, this looks like it would be easy to assemble, but putting this together tested the threshold of my patience. I started with creating the partition matrix in the center of the organizer first but the dowels do not hold this matrix together very well, and they keep slipping off during assembly. They were as tenuous as creating the foundation for a house of cards. At one point, I used a slight bit of force trying to keep this matrix together, and one of the dowels broke. I had to use a spare dowel left over from one of the other assemblies to complete this. 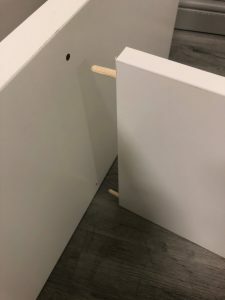 Similar to the Better Homes and Gardens cube organizer, the dowels had to be lined up with the holes in the side panels Getting the ends attached is a pain, because again, the dowels kept slipping out. While there are metal bolts that secure the end of this product (and required a little force to get these screws to line up with their openings, I do not feel confident in its use. Final assembly time took 50 minutes, much of the time was trying to keep the matrix partition stable and the getting the dowels to line up with the openings on the other panels. The Threshold Cube Organizer has a look that this should be sturdy but it’s not. Despite the thick top and bottom, after construction, this feels shaky. That misleading appearance worries me because I can imagine that if children could attempt to climb this. Although most likely, a few adults might stand on it because they thought it looked sturdy when reaching something high. Cube organizers are NOT substitutes for stepladders and stools, but experience has proven that in the absence or convenience of such things, it is likely to happen. A college student can use this to store books, or someone could use it to hold curios and knick-knacks. As long as no bears much weight on it, it is still better to use than the Room Essentials or ClosetMaid organizers. In fact, the instructions for this organizer state the weight capacity for each shelf is 30 lbs., INCLUDING the top shelf. Yes. For that price, you can find something sturdier in comparison. 2 out of 5 cubbyholes. Mainstays is a Walmart brand focused on more affordable versions of ready-to-assemble furniture, and home décor. 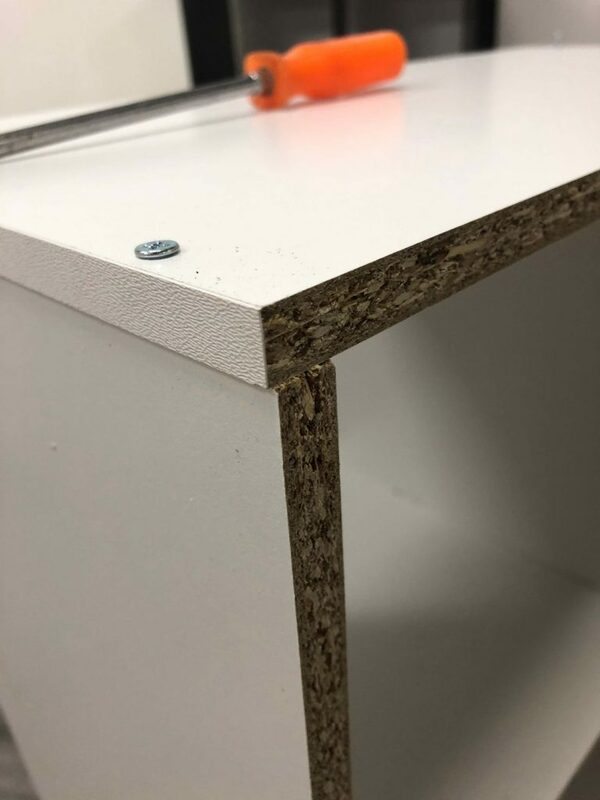 The main materials for this cube storage according to the Walmart site are Engineered Wood or Wood Composite, which is a different way of saying particle board. The package arrived with decent packaging, and although this item was in black, there were almost no scratches. The whole package is 41 lbs., making this on the lighter side of these cube organizers. 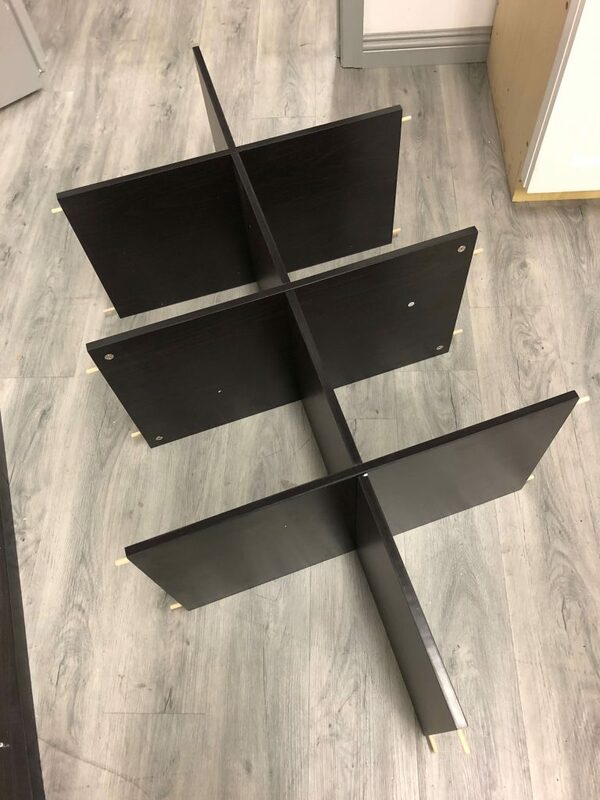 This cube organizer comes with an L-shaped bracket and fixings for mounting and black plastic tabs to cover the screw heads. 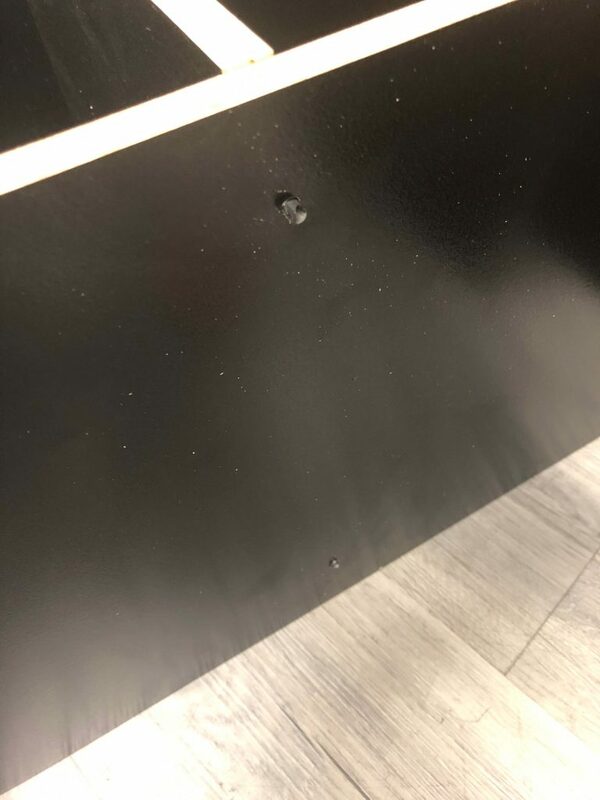 There is also a cardboard backing in black with nails for the potion of having back panels of the cube storage, and they were much nicer than ones from Room Essentials/ClosetMaid. This product comes in black, gray and white. Right away, I saw that all the boards had labels, so I thought this was going to be helpful. But going over the components, this package included thin plastic dowels where I thought wooden dowels would be. 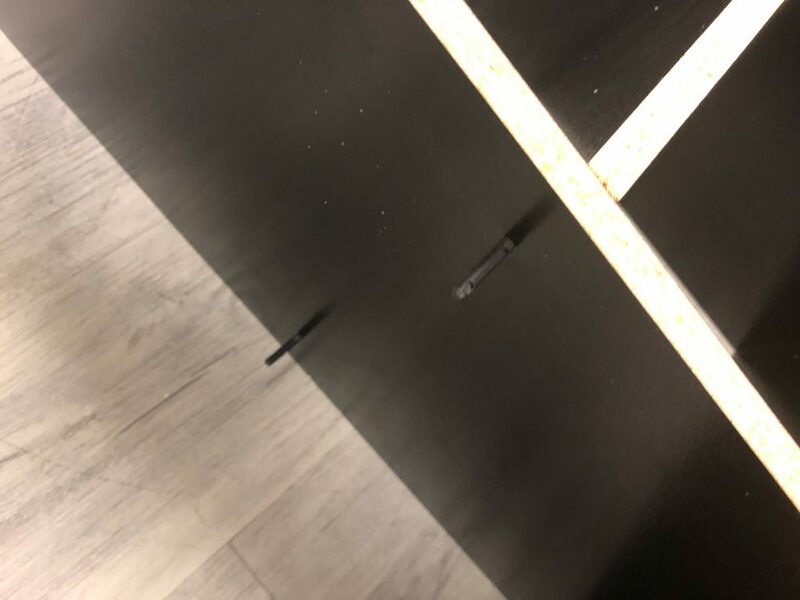 Maybe this was a better type of fixing because this would be more flexible than the wooden dowels; the rigidness of a couple of the dowels in their position in ClosetMaid caused them to snap. But as I assembled this cube organizer, they were too flexible. Not only that, but they did not fit into the holes easily without some force. Then something even worse happened. Due to a little force to get things to line up, the plastic dowels snapped and broke in their holes. 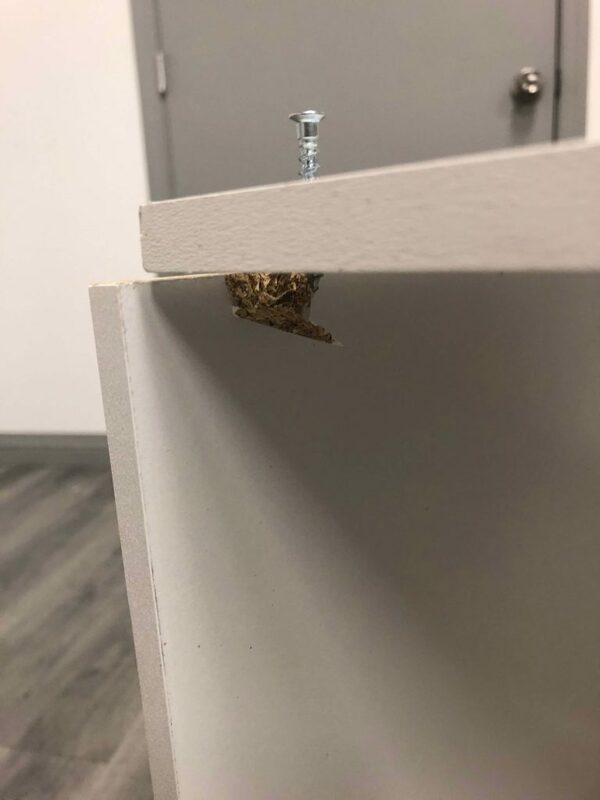 Because of where they snapped, it was impossible to get this out of the particle board without clawing through sawdust. Since there were no extra plastic dowels and this board was unusable, I completed this product without that board. 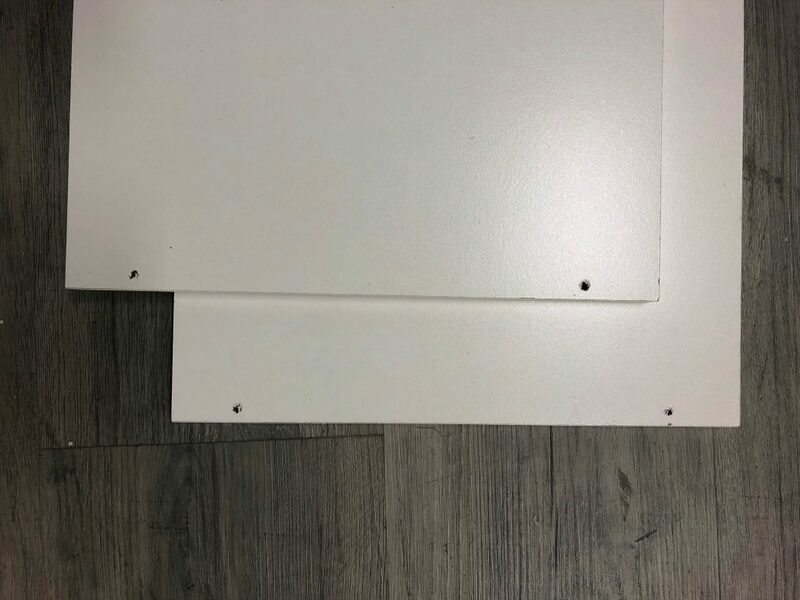 Not to mention, the holes were very close to the ends of the board like ClosetMaid, but also two of the screw heads ended up nearly stripped. Screws had a lot of resistance going into these openings. I did not think that I would have a worse experience than ClosetMaid. I underestimated that. Complete assembly took 50 minutes with 10 minutes debating if I wanted to finish this product. This picture was the result of the Mainstays cube organizer with the board missing. The dowels are there to show where this board would have been if the plastic pieces had no snapped. Gluttons for punishment who think they can “make do” with incomplete furniture. 0 out of 5 cubbyholes. By the way, these reviews don’t come out of nowhere. Here is a video showing one of the assemblies that I use to compare when writing this review! After assembling seven different cube organizers, I did not realize how much difference there is in cube organizers until I examined them closely by going through this process myself. Navigating names like “Wood laminate” and “wood composite” make a difference because they have the appearance of wood, but they do not have the strength or support of what the average person thinks of as “wood.” Most of us will put up with the assembling process because it is relatively simple to get to our finished product, but better fasteners, labeling, and better-quality materials should be considered because it affects the result. Also, it does not cost much more to get a quality product that is easier to assemble with a better appearance. Do you have other things you would like to see us review? Please let us know in the comments with your suggestions and possible topics!